Global Portable Air Compressor Market size was estimated over USD 7.2 billion in 2017 and will exhibit growth of over 3.5% up to 2024. 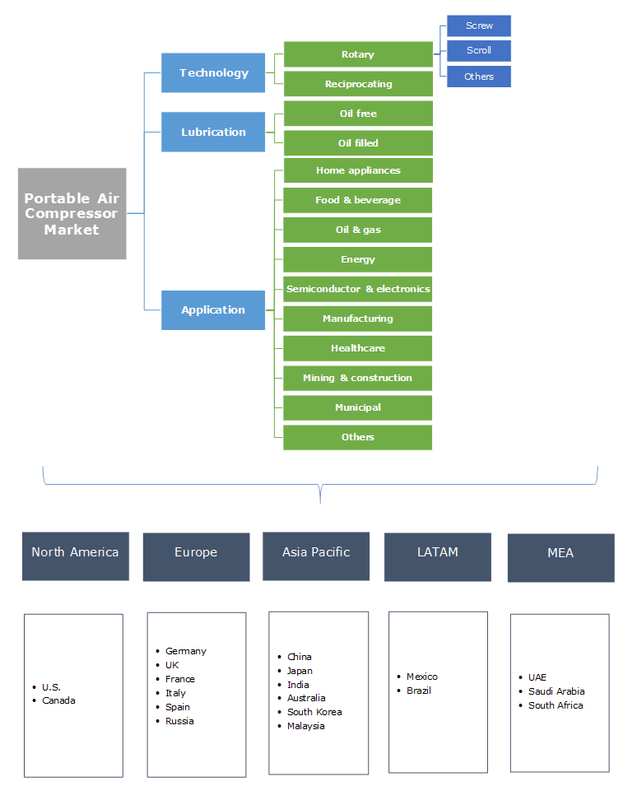 Compressed air is the most extensively used form of energy, regardless of its expenses. From inflating tires to mining activities, air compressors come in handy for different types of ventures. The term portable varies from light weight handy air compressors in garage to huge wheel or utility mounted air compressors used in mining and quarrying activities. These apparatuses are built with movability in mind from one place to another. The products are available in different sizes owing to development in their mechanisms for ease of use. Compact designs and structures have led to reduction in the portable air compressor’s weight which in turn is saving energy costs and developing the overall performance of the machines. Ease of transportability and efficient energy consumptions are the major factors driving the portable air compressor market in long run. Air compressor performance is one of the major concerns while employing them to any activities. Portable air compressors need lesser maintenance owing to their structure & designs and are also lighter in weight. These machines employ advanced mechanisms and hassle-free features which enables them to operate easily and with lesser maintenance than the stationary air compressors. Rising use of portable air compressors in mining and quarrying activities will drive the market growth in the forecast timespan. The market will undergo slow growth due to fluctuation in oil prices. The typical lifetime costs of air compressors are divided into its maintenance costs, equipment & installation, and energy costs; of which the energy costs about 75%. This is due the high demand for fuel to run the machines. Fluctuation in oil prices will lead to increased costs for operating the machines which in turn will hinder the portable air compressor market growth. Portable air compressor market is segmented on the basis of technology as rotary, reciprocating, and centrifugal. Rotary screw, scroll, vane and root blower are some of the subsegments studied in the report. Rotary air compressors hold a maximum share of approximately 60% in overall industry. Rotary scroll compressor revenue exceeded USD 1 billion in 2017 and is said to grow with a CAGR close to 3.5%. Rotary screw air compressor is a form of gas compressor frequently used to substitute piston air compressors where huge volume of high-pressure air is needed. These compressors are used for large industrial activities as well as for the operation of jackhammers which are high-power air tools. On the basis of volume, rotary screw air compressor market is said to gain steadily in the coming years. Oil free and oil filled are the two major segments for the portable air compressor market by lubrication. Oil filled air compressors are heavier as compared to the oil free ones and require monitoring and maintenance from time to time. These machines are capable of handling higher pressure and can be used for certain heavy-duty tasks. Oil free air compressors are lighter in weight and maintenance free considering no lubrication is required for its functioning. There compressors provide a way better air quality with almost zero air contamination. As these compressors are light weight and free of maintenance, they cannot be used for heavy duty activities in industrial and commercial purposes. The segment is said to grow at a higher CAGR of over 4% in the portable air compressor market. Portable air compressor market comprises of wide range of machines of different sizes, power and weight. These find applications in various end-user industries such as building & construction, food & beverage, oil & gas, mining & quarrying, semiconductor & electronics, manufacturing, healthcare, and others. The others segment comprises of household activities, agriculture, water treatment, entertainment, etc. Manufacturing applications is said to hold a major share in the portable air compressor market. on the basis of volume, the segment is said to exhibit growth with over 3% CAGR in the forecast period. Oil & gas segment is said to grow at a higher CAGR of close to 4% from 2018 to 2024. The segment was comfortably valued over USD 200 million in 2017. Considering revenue, Asia Pacific, owing to strong industrial and developmental activities in China, is said to exhibit highest growth rate of over 4% from 2018 to 2024. China portable air compressor market is said to witness substantial gains owing to huge automotive, oil & gas, construction, and manufacturing industry. China recorded a revenue of close to 2.3 billion in 2017 and an estimated growth with a CAGR of over 3.5%. Europe portable air compressor market will grow at a slower pace owing to noise and emission restrictions and regulations in the region. The region led by Germany will showcase growth at a fair rate owing to significant presence of end-user industries such as manufacturing, healthcare, and building & construction. Atlas Copco, Hubei Teweite Power Technology Company, Ciasons Industrial, Gardner Denver, Kaeser Kompressoren, Ingersoll-Rand, Elgi Compressors, Rolair Systems, Doosan, Sullair, Sullivan-Palatek, Quincy Compressor, Mat Holdings, Vanair Manufacturing, and Belaire Compressors are some of the major players in the portable air compressor market. Atlas Copco recently introduced an electric portable compressor range which helps energy costs cuttings by up to 50% as well as saving substantial amount of fuel every year. These smartly designed electric compressors safeguard low cost of possession and improved environment trail. Portable air compressors find application in various industries such as manufacturing, healthcare, building & construction, food & beverages, etc. Rising use of portable air compressors owing to movability convenience will propel the portable air compressor market growth in the coming years. They are preferred wherever the workstation location changes constantly or even in occasions when a single air compressor is used in more than one workstations. They are also used in offshore activities such as oil rigs, construction works, etc. where huge stationary compressors are not possible to use.